I may be a lot of things - a woman, a writer, an employee - but my first role, and proudest, is that of mom to the now thirteen year old Intrepid Junior Blogger. Being a mom is a joy, and an honour - but it's not always an easy job, either. Once a year we take some time to together to celebrate not my being a mom, but our relationship as mother and daughter, and for the last eleven years this has happened right here in Fort McMurray. A lot has changed since my first Mother's Day here, of course. The IJB has grown and changed (grown enough to require constant restocking of things like leggings and shoes, and since she has her mother's clothing and shoe habit this is a fairly constant event), and so too has our relationship. This past weekend we celebrated thirteen years of a mother-daughter relationship, and we did so over the course of two days. It began at the local theatre Saturday evening with a screening of Ironman 3 in 3D. The IJB and I screeched in moments before the show started, securing our seats and then quietly mowing down popcorn and twizzlers and gallons of pop. This is the same theatre we have been coming to for eleven years, too, and we have seen so many movies here, from stories like "Up" (where she moved to another row when it became clear I would not stop crying and sniffling and embarrassing her) to movies like the one we saw on Saturday. I realized as we sat there how even the movies we view has changed over the years, from children's favourites in the past to now more adult fare. We sat and laughed and gasped and swooned over Robert Downey Jr. (that's rather new, too). And the theatre was even a nice temperature, unlike the time I went to see The Hobbit and found the theatre the same temperature as the inside of my fridge (by the end of that movie I was wrapped so deeply in my coat and scarf I resembled one of the Star Wars sand people, just my eyes peeping out, and my fingers were numb). We dragged ourselves home after the movie, with a mild popcorn hangover and full of moments from the movie to share. With a smile on my face and love in my heart I kissed her goodbye as I had a couple of errands to attend to, including checking in on the Mother's Day Brunch at MacDonald Island Park. I arrived at MIP to discover the brunch in full swing, and I perused the shoe and jewelry vendors who had set up little shops for the moms to enjoy. I had a bit of the brunch, delighted to find the food excellent as usual and feeling proud of the job done by the hospitality department of the place where I now work. I then moved on to my next stop, which was the second annual Designer Handbag Auction from the Wood Buffalo Food Bank. The "It's In the Bag" Designer Handbag Auction is one of my favourite annual events. Last year I donated a purse...and then I bought it right back as I wanted it so badly. This year I had my eye on a little green Matt and Nat bag, but when I arrived at the Sawridge Hotel I discovered a small turquoise Matt and Nat, as well as a Coach bag that pretty much screamed "Me me me". And so I placed my bids, and ventured to the grocery store to secure the goods to feed the IJB for the week while awaiting notice to see if I won the bags I so desired. It didn't take long, and if you were in the downtown Safeway and heard hooting noises on Sunday that was me celebrating the successful bid on two new bags. I headed home quickly and picked up the IJB as we had another date - supper at Earl's and tickets to a show at Keyano Theatre. Over supper we discussed several things, with a strong focus on Twitter as the IJB uses that social media format to do role playing games (a subject I plan to explore in a new blog I am writing at Medium). And then, after this surprise tuxedo strawberry ending to the meal we headed to Keyano - and to see a friend of ours. You see two years ago we had the chance to sit down and have supper with Canadian performer, comedian, actor, and genuinely amazing human being Shaun Majumder and his gorgeous fiancé Shelby Fenner. He was here back then to do some filming for his series "Majumder Manor", and to raise some funds for the bed and breakfast project in his hometown of Burlington, Newfoundland. Now, Shaun and I connected over issues like community and creativity, but he and the IJB formed a real bond as she too loves the performing arts. He was so kind to her back then, sharing with her wisdom and lessons learned over his years performing, and we were so excited to see him back in town to once again raise money for the project so dear to his heart - a bed and breakfast that will help to restore the economy in the place he was raised. We sat in the theatre, the IJB and I, enjoying the musical act Shaun brought along from Newfoundland and the comedy of opening act Nigel Lawrence. The IJB was likely one of the youngest in the crowd, and I suspect some may think she was too young for some of the humour which tipped into the raunchy on occasion - but all I can say is that she is in Grade 8 at a junior high public school, and the performers didn't say anything she hasn't already heard at lunch time. We laughed at Nigel's antics, but it was during Shaun's performance that we truly roared, tears running down our faces. And when Shaun spotted us in the second row, saying hello to us and calling the IJB by name - well, it would be hard to top that. In front of a sold-out theatre he included the IJB in his show, mentioning her several times, and each time she beamed, making her mother's heart glow. After the show we headed outside and joined the line to have Shaun sign a t-shirt and photo - and when he saw us there were hugs and kisses and a genuine exchange of affection. He asked the IJB about her performing exploits since he saw her last, and she was able to share the news of her recent role in the musical "Annie" at school. We parted by sending our best wishes to the lovely Shelby, who was his fiancé when we saw him last and is now his wife, and with promises to keep in touch. And then, late Sunday night, we crawled into the car and headed home where we exchanged our own hugs and kisses, mother and daughter both exhausted and once again reminded of the strength of our bond. I tucked in the IJB and we chatted for a bit about Ironman and Twitter and designer bags and Shaun and then, finally, we both went to sleep, another Mother's Day in McMurray over - except for me every day is mother's day, because that is what I am - and it is the very best job in the world. The fact that I get to do it here, in the place that I think is the best place in the world? Well, that's just the icing on my Mother's Day cake. 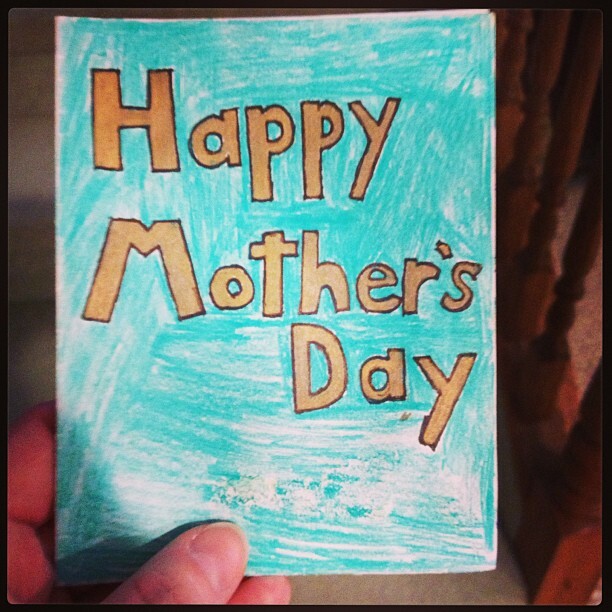 Happy belated Mother's Day, Fort McMurray!